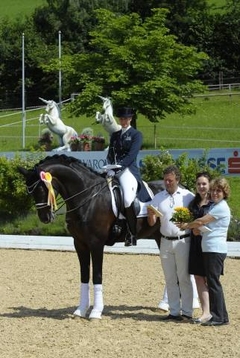 Donna Caribica and San Francisco OLD placed second and third in the St. Georges under Wibke Bruns/GER at the Schindlhof owned by the Haim-Swarovski family. 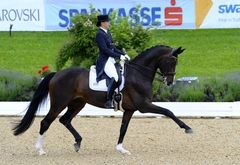 The eight-year old Don Frederico daughter Donna Caribica rode a very expressive trot tour and was rewarded with scores up to 8.5 for the extensions and half-passes. The mare, who has not been presented in international competitions before, also had a convincing canter. Only one mistake in the half-pirouette cost valuable points. A total of 72.02 percent meant second place for Donna Caribica, just ahead of her stable mate San Francisco OLD, who had many highlights but also a couple errors in the flying changes which dragged him down to 71.42 percent. It was quite a remarkable achievement for both of these young horses since they have not been to that many shows – especially in view of strong competitors.